The minimum recommended size of a 1-car garage is 264 sq ft and 2-car garage is 400 sq ft. But go bigger when possible to make it more comfortable. Assumptions: This calculator estimates the cost to build a detached garage, a freestanding building which you have to walk outside to get to. This garage does not include an enclosure along the path or a covered walkway, which of course could be added for an additional expense. Detached garages are usually added after the home has already been built, but they can still be made to match the current look of the home. 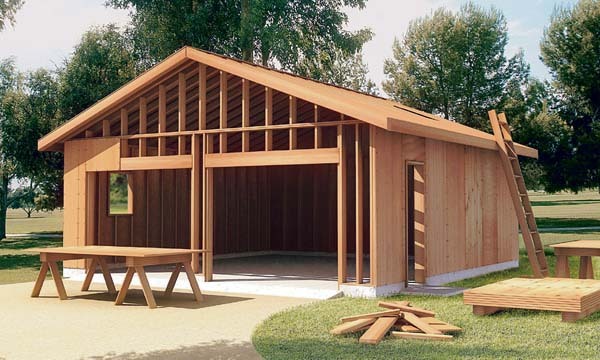 This estimator will give you a rough estimate of the cost to build a detached garage or shed. With a project this large there are a LOT of variables associated with determining an exact value. This calculator does as good a job as can be expected given a single input variable - square footage. Obviously your cost will be determined on your exact choice of design, number of doors and windows, quality level of materials, who does the work, who manages the work, etc, etc. Be your own general contractor and save 20% right away. It does take a lot of time, but it was worth the savings for me. I recommend that you...1. Read this book to learn the basics of each construction phase 2. Find reputable contractors by using angie's list (craigslist contractors are usually cheaper but I would avoid). Use promo code SAVE25 to save 25% at angie's list. Get 'labor only' bids and buy the materials yourself. This allows you to use a 10% off coupon at Home Depot or Lowe's (available on eBay ). You can also use a 5% cash back credit card. Be sure to visit ebates first to save an additional 1%. These are all small percentages but when taken off potentially very expensive items they really add up. Rent the tools you need at Home Depot or buy used on craigslist. Do (at least some) of the labor yourelf. Keep in mind that with the proper tools and knowledge (and time) you can do any or all of the construction phases yourself. If you read and watch enough videos you can definitely learn and do each of the steps to build a garage yourself. 1. How big do you want the garage to be? The size of your property probably dictates whether an attached or detached garage is the best fit for you. Detached garages can be placed in odd areas on your property. 2. How big can the garage be (city ordinances)? 3. Where and how many doors and windows? 4. What type of roof? This calculator assumes you'll install an asphalt shingle roof. 5. What type of siding? House siding is needed to close the exterior surface of the building and it offers an opportunity to choose enhancements in appearance as well as insulating properties. Vinyl is what's assumed here and is a common choice of siding material. If you are considering a project that involves building a detached garage, there are several things that you should consider. There are numerous design options available, multiple materials that can be used, and the cost of the project should be accurately determined before work gets underway. By educating yourself and having all this information gathered, you can make the best choice for your personal needs and budget constraints. As with any building project, building a garage can be stressful. With the proper planning and organizing, you can get the building that you envision while not excessively going over budget. As an example, different garage designs are going to have different costs. You can also make garages in basically any size, and size will also impact your cost. A basic, yet effective way, to estimate the construction costs for a detached garage is to apply the typical construction cost of $30 to $40 per square foot if you are planning a basic one-story building. You can choose from multiple detached garage designs and each has its own pros and cons. The reason most people still opt for a detached garage because of the advantages of going with such construction. The versatility of detached garage plans make them remain popular today. While many garages are added after a home has been built, it is important to note it would be quite a challenge to add a garage onto a fully constructed home. Your garage design has a lot to do with your individual needs and your plans for use. You may want to house multiple vehicles, store an RV, or have a workshop, game room, or sewing room. Your ideal garage may have plenty of shelves and closets for storage space, or it may need to be set up to repair autos. Regardless of what you have in mind, there is a perfect floor plan for your needs. There are several other advantages to owning a detached garage besides the design versatility. Detached garages also offer noise reduction, safer hazardous materials storage, and reduced heat loss from the main house. Now when you match these measurements up to garages, you should consider this. The average single car garage is either 10 feet, 12 feet, or 14 feet wide. The average two car garage is either 20 feet, 24 feet, or 28 feet wide. If you plan on adding storage along with the vehicles, you need about 4 feet extra for tools, storage boxes, or bikes. If you are storing bigger things, such as a freezer, refrigerator, or work area with a work bench, you need an extra 8 feet. When you plan to add things like ATVs, lawn mowers, a boat, or an RV to your garage, you will need to construct a garage that is at least 32 feet long. Taller vehicles, such as RVs, also require taller height as well. For the traditional two-car garage, the average reported cost is $24,682 for 2016. The actual price is dependent upon many factors. A detached garage costs more than a detached garage because you will construct all four walls instead of just three. Because it is a detached building, you will need several different professionals to make your project a success. You will hire electricians, painters, and carpenters depending upon the complexity of your garage. The materials alone, calculated at the average $40 to $50 per square foot price, will total anywhere from $5,000 to $7,000. The additional costs go toward the costs of hiring the contractor, any sub-contractors, and paying for any required building permits. Garage apartment plans are traditional garages that include finished living quarters. Typically, the garage is on the main floor with parking for one or more vehicles. The living space, which is located upstairs, is often modest, practical, and efficient. This garage can be constructed using a variety of architectural styles, including European, Craftsman, or Traditional designs. The garage apartment usually has one or two bedrooms, one or two baths, a kitchen, dining area, and a living room. Garage apartments resemble the carriage houses of years past. Because there is a second floor of the garage, the cost will be considerably higher. You are basically getting double the square footage. The average two-car garage with a 500 square foot apartment costs $45,000. If you want extra storage, you can construct your traditional garage with the number of bays that you need below and add a loft. This is much cheaper than the apartment approach because you are leaving the upstairs floor open and it isn't as tall as living quarters. You can construct lofts that are only two or three feet high where you slide items in from a trapdoor with a ladder, or you can construct it tall enough so you can stand or walk around hunched over. Regardless, you aren't finishing it or subdividing rooms, so you don't have to worry about the additional construction costs to finish that area. The traditional two-car garage with a standard loft costs about $30,000 to build. While there are many more options for garage styles and designs, this should provide you with the general knowledge you need so you can make the best choice for your individual needs. You want to build a garage that you can use and enjoy for years to come. Deciding to build a detached garage is not a light hearted decision. It's not always as simple as creating another structure on your property. You may own the property but building permits and approval procedures are in place. Here, we will only touch on that simply because the permit procedures for each state will vary. Step One Permits: The first place to make contact with prior to any design work is the permit office. It's best to save yourself the trouble by not getting too attached to a specific vision for your detached garage design until you know the facts about your permits. Contact the Bureau of Permits for your city and go from there. Types of Permits you May Need: Answer the questions about what your detached garage will be used for first, then you’ll be able to consider what features that will require a permit. This is better than doing it all backwards and saves you a lot of stress. What are you using it for? It’s ever so important as we touched on earlier to make sure you know what the vision for your detached garage is. The term garage is relative and could mean office or storage unit or a space for the extra car or hobby shed. Carefully deduce what the use will be so you know what you can expect permit-wise. This also helps you understand what contractors you'll need to do the job. Make sure you have adequate ventilation: This is not only important when you're actually going to use it to store a car. It's important to have adequate ventilation whenever you may use it for a hobby that requires you to use caustic chemicals. Both the car and hobbies will cause deadly fumes to gather. Parking your Car: Size matters in this case in relation to the vehicle being stored. Make sure you adjust accordingly. Heating and Cooling: Make certain you consider the heating and cooling plan for what you're using it for. You don't want to spend a ton of money and be restricted from using it comfortably in uncomfortable temperatures. Seal the Floor: Consider what type of epoxy to seal the floor with. High quality is suggested regardless of what you use it for. Building a detached garage is an investment that goes down pretty well when you sell the home. If you invest in the full Monty, and it's got running water and electricity, it can double as a guest house or rental as long as the correct permits and permissions are acquired. Great as parking for your guests as well. Is it worth it? This is a relative and very personal choice. Be sure to use the garage cost calculator shown above to give you an idea of the cost involved to build a garage on your property. The tool breaks down the cost for each of the major tasks involved into labor and materials. You can always save on cost by doing the work yourself. Do you plan to build your garage yourself?